First Wednesday of the summer for me, so hopefully I can visit a couple of blogs and read their answers. I'm linking up with Joyce; click on the image above to visit and meet some awesome people! My living room & hallway is gray, but my kitchen is yellow, spare bedrooms are "mushroom", and master bedroom is a shade of green. So, I don't think I have a prominent color. Ride an overnight train. When I went to Germany with the high school group, we rode a night train from Munich to Berlin. Between trying to make sure my hair looked okay & still trying to get some sleep, I got very little sleep. And my back hurt from trying to stay in one position all night. I like shoes, and I love to get pedis. I don't like to receive flowers as a gift, and I'm not a big jewelry person. CH is down to 1 motorcycle. At 1 point, I thought about learning to ride, but I'm not observant when I'm in my car. It's best that I stay on 4 wheels. I've ridden a little with CH, but not a lot. We have a new granddog. MS was at a friend's house and she was there. Someone asked the family if they would watch her, but they never came back for her. 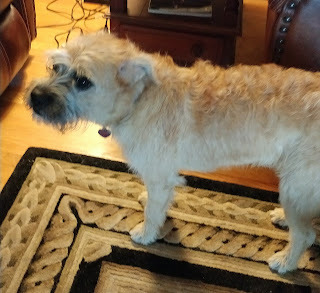 Being a terrier, some of her actions are like Pepper (my Jack Russell Mix), so I think MS kind of fell in love with her. MS calls her "Girl Dog", but I'm trying to get him to find a more suitable name. Girl Dog is cute! We have three terrier-mixes here. Such loyal and devoted dogs. The overnight train in Germany does sound very uncomfortable. Hope you have a great week! What an adorable little dog! I can't believe the owners didn't come back for her but that was probably a good thing. :) Did I know you don't like getting flowers for a gift? I am the very same way. Husband used to give them to me all the time and I kept telling him I do not like cutting living things just so they can be brought inside to die. He kept on. Because his mother loved getting flowers. He finally got it but he still gives me outdoor plants. One day he might come to the realization that I am not his mother nor do I wish to be. LOL I cannot ride on a train due to the experience of the steam engine at Tweetsie when I was 5 and the cowboys and indians shooting it out. Terrifying. Can't ride a train to this day. Are you out of school? Aww...Girl Dog sure looks like a real sweetie. We had a Jack Russell named Hunter who passed away 2 years ago. We loved him. I enjoyed your answers...enjoy the rest of your week! GIrl dog is cute! We had a wire haired terrier when I was growing up, and she was such a good dog. Summer vacation!! Whoohoo! Enjoy! Daughter2 is counting down the days, but isn't officially in summer mode until the first week of June. What about "Buffy"? That name just popped into my head when I saw the picture of Girl Dog. We have a grand-dogger Jack Russell Terrier/Chihuahua mix. Her name is Petra. Girl Dog is a pretty dog, too. The only train that I've ever ridden and remember is the mine train from Six Flags. :) I don't think that I could sleep on a train at all. It sounds like you have a pretty colorful house. I think that's great! Girl dog looks sweet. I can't understand anyone who would abandon a dog. I like that you have color in your home. We are just starting to do that! Welcome Girl Dog, she is adorable.